Personalised Engraved Hip Flask Set in a Wooden Gift Box. 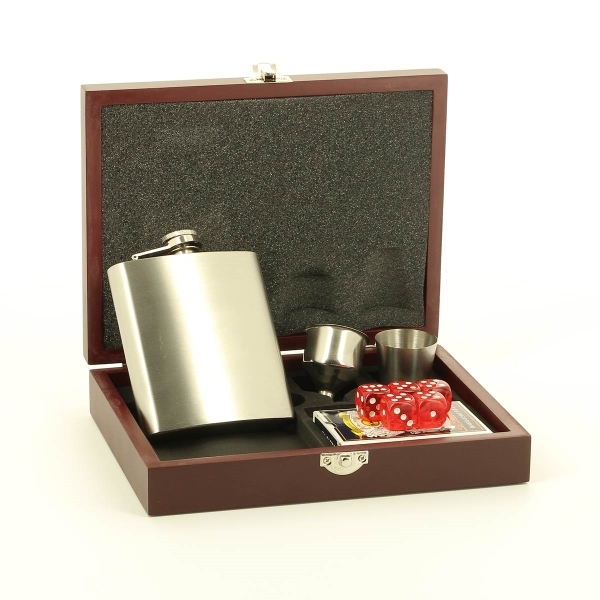 Engraved 6oz Hip Flask with Shot Glass, Funnel, Dice and Cards in a Rosewood Finish Wooden Gift Box. The Wooden Gift Box measures 8 x 8 x 2 inch. The engraving will be on a gold engraved plate placed on the outside of the wooden box. There is no limit on the amount of engraving that you can have but please remember the more you have the smaller the font size will be. Please choose from a font in the drop down list below.